For those looking for a summer travel deal at a Mexico hotel, Marquis Los Cabos Resort offers up to a $985 value by allowing summer travel guests to choose a complimentary third night, $500 resort credit, two days of complimentary rental car or a complimentary upgrade. Special promotional rates in addition to “Design-it-Yourself Savings” give Mexico vacationers the opportunity to choose between a complimentary night, resort credit, room upgrade or car rental. The summer travel deal enables guests to save up to $985 on a summer vacation at the all-suite beachfront Marquis Los Cabos Resort. The Summer Savings Promotion at Marquis runs now thru October 10, 2010 and provides room rate savings as well as a choice of one of the following: a third night complimentary, a $500 resort credit (casita only), two complimentary days with a rental car or a complimentary upgrade to a Marquis Suite with private pool (Junior Suite only). Until October 10th, rates start $250 per night for a Junior Suite and $985 per night for a Private Pool Casita. 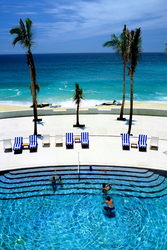 For additional information or reservations, please call 1-877-238-9399 or visit http://www.marquisloscabos.com. Recently featured in National Geographic Traveler’s “Hotels with a Heart,” the Marquis Los Cabos donates five percent of the hotel’s annual revenue for the staff’s education and healthcare in its Marquis University. Since 2003, the resort has helped on average 20 employees a year obtain primary schooling and bachelor degrees. The 237-suite beachfront Marquis Los Cabos Resort is located on the southernmost tip of the Baja California península, where the Sea of Cortes meets the Pacific Ocean, and is minutes from the authentic Old World village of San Jose del Cabo as well as the lively town of Cabo San Lucas. The resort features a 15,000 square foot holistic spa and fitness center, an exclusive gourmet restaurant where a Michelin-pedigreed chef prepares a nightly prix fixe menu, and an extensive collection of Latin American sculpture and painting on display in public areas and guest suites. Since its 2003 opening, Marquis Los Cabos has earned the travel industry’s most coveted awards including “World’s Best” (Travel + Leisure); “Gold List Award” (Conde Nast Traveler); “Best Value” (Conde Nast Traveler); the AAA Four Diamond Award, and the Five Star Diamond Award for its Canto del Mar restaurant. Marquis Los Cabos is a member of the prestigious Leading Hotels of the World and the only member of Leading Spas of the World in Los Cabos.